If there’s one thing many Montanans can agree on it’s a love for beer and Anaconda is no different with its newest brewery open in 2017. The brewery will be dubbed Smelter City Brewing, and Luke Carlson, 36, along with his parents Gary and Kathy Carlson, are the driving force behind the business. Carlson, who restores historic homes for a living, devoted his weekends toward renovating the property, which consists of two stories and 10,000 square feet of usable space. Renovations include new water, plumbing and heating and a roof replacement, but of all the renovations, those that bring the building close to its original condition are the most important to him, said Carlson. Built in 1895, the building once boasted 14- and 16-foot ceilings and is included on the National Register of Historic Places. The Anaconda Co. purchased the building in 1910 and used it to house its payroll, electric light and railway department and water department. The building got its namesake after Anaconda Co. decorated the facade with a row of lights, advertising the Smelter City as one of the first electrified towns in the state of Montana. Aside from being known as the Electric Light Building, 101 Main Street was also known for its industrial features. But time always seems to change things – including cast-iron metal. In the 1940s the building’s ceilings were lowered and many of its iron columns were covered with drywall or wood. In addition, before the Carlsons purchased the building in 2014, it sat vacant for several years – “to the point that people didn’t notice it anymore,” Carlson said, adding that many of its windows were boarded up as the roof fell into disrepair, but thanks to the new project, several of the original features of the Electric Light Building have been restored. Carlson raised the ceilings to their original height and replaced the boarded windows. What’s more, Carlson has recovered 19 of the building’s cast-iron columns, at first, Carson said, he wasn’t sure if of the iron columns still existed beneath the drywall, and so he broke a hole in the white, plaster-like material and stuck his hand inside. “Sure enough, you could feel them still inside,” said Carlson. When all is said and done, the building will include a brewery with five fermenters and five serving tanks, a lobby and an art gallery operated by Carlson’s girlfriend Katie Sletton. Development on the second floor won’t happen until phase two of his project, Carlson said, but in a 2014 interview with the Montana Standard, Gary Carlson said the family wanted to build apartments on the second story. 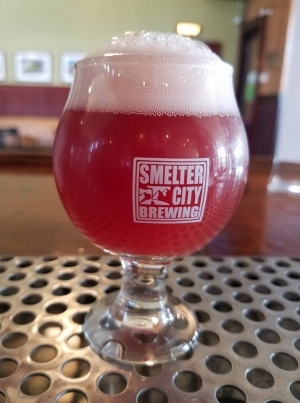 When asked whether he thinks Anaconda – a town of about 9,300 – can sustain a brewery, Carlson said he believes that Smelter City Brewing can serve as a tourist destination and contribute to the vitality of Anaconda’s downtown district. “A thriving business is a great way to contribute to the local economy,” he said. Carlson has been home brewing for about 10 years.